Following on from their good work with the Clear Climate Code project, Nick Barnes and David Jones have co-founded the Climate Code Foundation with Philippa Davey. The Climate Code Foundation is a non-profit organisation founded in August 2010, to promote the public understanding of climate science. 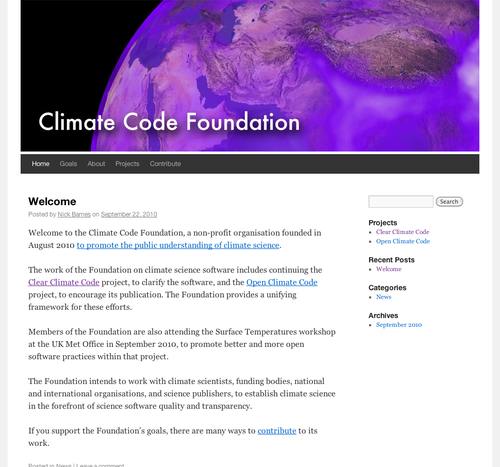 The founders have been working for several years on the Clear Climate Code project, improving the clarity of the source code of climate science software. They have also started work on the Open Climate Code project, to encourage the publication of more source code in climate science. The Foundation has been created to act as an umbrella body for these and related projects. If you are interested in climate science, please check out how you can contribute and help the foundation realise it’s goals.